the hubs is off today after his 10 day shift..
he is working (and honestly, swearing) his way through a mastery course for work. after doing a little research online i picked up a transfer pen & some tracing paper yesterday @ joanns. and i have a plastic organizer thing full of embroidery thread my granny gave me for my birthday one year when i was a teenager & making friendship bracelets was all the rage..
(at the top is some failed lazy daisy stitches & french knots.. those definitely need work! i got it all together last night & then fell asleep watching the old version of king kong. so this morning after the dude was off to school..
and the babe was fed & down for his morning nap..
i pulled out the pen & doodled on some scrap white fabric. it's bringing back memories of all those things i made in middle school home ec. 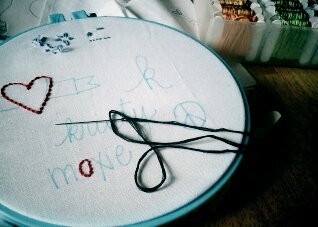 but i do have some questions for you master embroiderers out there..
1. do you knot before starting? i remember my mom cross-stitching & just tucking in the ends..
2. how many strands do you use of floss? do you vary it by project & expected end result? 3. what is your favorite material to work with? have you used regular old cotton? 4. do you have a favorite online source for patterns? 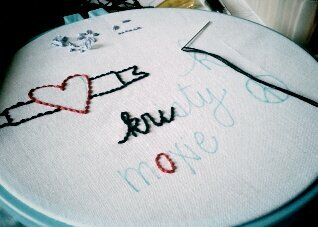 off to do some more doodling & stitching..